Design size: 12"x18.25"; each tile is 3"x6.25"
If you like the modern subway tile look but don't feel like splurging on a real tile - look no further! With our economical Subway Tile stencil creating that Pineterest-worthy tile kitchen backsplash is just one stencil project away! Grab a stencil brush and create a beautiful subway tile look for a fraction of the price of real subway tile. 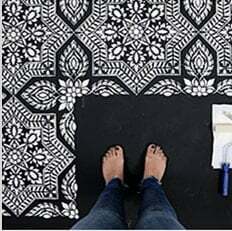 Our stencil is designed in such a way that you'll be stenciling the grout lines. Which means that your wall color will end up being your tile color. For stencil alignment instructions please refer to the step-by step photos above. Our wall stencils are expertly designed by professional decorative artists, so stenciling a wall with Cutting Edge Stencils is easy and intuitive. Please make sure you watch our instructional stencil Video Tutorials! You'll find them extremely helpful for your stenciling project. Even beginners get great results!